We believe that Jesus left us sacraments, physical outward signs, to help us connect in our physical bodies with moments where we are literally saturated spiritually by God’s grace, by God’s love. Because of the message we read in the Gospel of John chapter 6, which the church calls The Bread of Life Discourse; we believe that Jesus is truly present in the Eucharist – physically present! Because of his physical presence in this sacrament the church calls this belief – “the summit of our faith." Receiving the Eucharist is closest we can get to Jesus Christ in this life. It is so important for us to embrace this truth of our faith. How blessed we are to believe in Christ’s true presence among us. All of our great symbols and actions are connected to ours being a sacramental church. Ours is a sensual faith experience. This is why we use color and vestments. We love holy water, candles and incenses. We bless ourselves. We share a physical sign of peace at Mass. So much of our faith experience is physical because of this sacramental character of our faith experience. And we believe the sacraments are powerful! We don’t always see this in our world, but every once in a while you do. In this book, Father Robert De Grandis recounts dozens of miracles from his many years of ministry. He tells the story of Father Richard Woldum who was assigned as hospital chaplain for one year. I want to share Fr. Woldum’s story in his own words. One morning I received a call to come to the emergency room to see an 11-year old boy named Johnny who was dying. I found him on a breathing machine, his head swollen very large. Johnny’s parents told me that he had been riding his bike on a gravel road near his home when a truck came flying over the hill and hit him head-on. The collision caused him to be thrown into the nearby field. When the ambulance arrived the medics found his head cut wide open with half his brains scattered in the field. They literally picked up the pieces of his brain, shoved them into his head, and took him to the hospital. When I asked Johnny’s parents if he had been baptized, they said, ‘No.’ They informed me they attended no church but prayed at home as a family. I asked them if they would like me to baptize Johnny. They glanced at each other as if to say, ‘It couldn’t cause any harm,’ then said to me, ‘Go ahead.’ They also said if I wanted to I could baptize him into the Catholic faith. That night, with the parents and two nurses as witnesses, I baptized Johnny. The next morning I was doing communion rounds when my beeper went off. Johnny’s doctor wanted me in the intensive care unit. ‘What you do last night?’ he asked in broken English, as I met him outside Johnny’s room. I explained to the doctor, a Buddhist, that I had baptized Johnny (with the permission of his parents) so that he could go to heaven. When I asked him why he was so concerned, he informed me that the boy’s swelling had disappeared. The doctor was still convinced that the boy would die, however; or if he lived, remain a vegetable, never moving, talking or even moving his eyes. That night Johnny’s parents thanked me for baptizing him. I then explained about the anointing of the sick and asked if they would like Johnny to receive that sacrament. With their agreement and in their presence I anointed Johnny. It was now the third night, counting the night of the accident. I suggested to the parents that they permit me to give Johnny the sacrament of confirmation. They agreed. The following morning his legs and arms were moving. The doctor said to me in front of the parents, ‘I no longer in control.’ He was simply unable to explain what was happening. That evening when I explained to them about the Eucharist, they said they wanted this for Johnny too. I gave him some Precious Blood with an eye dropper. The next morning he was making sounds. When I checked in on Johnny upon my return I learned he had been transferred to the third floor, which was the surgery unit. I went upstairs to see him, fearing that he had gone back to surgery. He was sitting on his bed, talking to his mother. After his recovery they took another x-ray of his head and found that the part of his brain that had spilled out in to the field had grown back. When I eventually talked to Johnny’s parents about becoming Catholics, they informed me they would continue praying at home. The doctor in the case started looking into Christianity. Three nurses converted to Catholicism. There is a power in our sacramental experience that we need to embrace. What he was telling us is we need to leave room for mystery in our lives. We need to be open to his power and work in ways unexpected. Is his presence in the Eucharist a great mystery? – Of course it is! But it is a mystery that brings LIFE. We humans have come to think we have it all figured out, but the truth is God’s GRACE is flowing into us through our sacraments in ways we can’t even imagine. 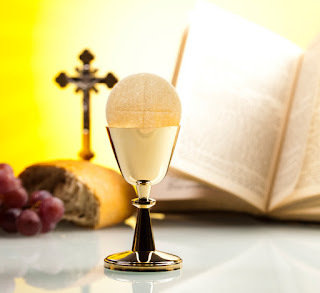 When you come to communion – celebrate this great faith we have as Catholics, and encounter Jesus who is truly present in a powerful, life giving way to you ... today ... in the Eucharist.